Brown vinegar, also known as malt vinegar, is made from barley. It is first made into beer and then allowed to ferment into vinegar. While brown vinegar is most popularly used in Great Britain as a condiment for fish and chips, it does have many other uses. According to HealthMad.com, people have been using brown vinegar for health purposes for centuries. Like other vinegars, such as apple cider vinegar and red vinegar, brown vinegar contains properties that kill off harmful bacteria. Soldiers in ancient Rome drank vinegar to fight off diseases like dysentery, says HealthMad.com. Brown vinegar’s other health benefits include fighting off sore throats, gout, kidney stones and urinary tract infections. Malt vinegar is also used in pickling vegetables. 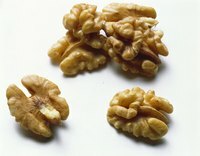 It is especially popular for pickling walnuts. When making pickles, malt vinegar can be combined with sugar and garlic powder. It is important to note that malt vinegar will darken the vegetables that it is pickling. According to the Cook’s Thesaurus, cooks in Canada and Great Britain prefer brown vinegar’s lemony flavor while American chefs prefer the tangy flavor of cider vinegar. Malt vinegar is also very popular in Great Britain for making chutneys. Since the brown vinegar is very acidic, it is not the best choice for making sauces or salad dressings. There a few different types of brown vinegar, light, distilled and dark, each with different uses. It is the distilled variation, the sharpest and aromatic of the vinegars, that is used most often for pickling. Light brown vinegar has an amber color and is used most often in making marinades. If you must use a brown vinegar for a salad, use light brown vinegar. Dark brown vinegar is the one most commonly used for fish and chips. Caramel is added to the vinegar which gives it the rich coloration and sweet and tangy taste that makes it famous. What Is a Substitute for Stout? How Does a Clear Plastic Bag of Water Repel Flies?